The one hundred and two drawings and the seven engravings which William Blake dedicated to Dante’s Commedia, considered by some to be the English artist’s greatest masterpiece, sprang from a complex relationship. 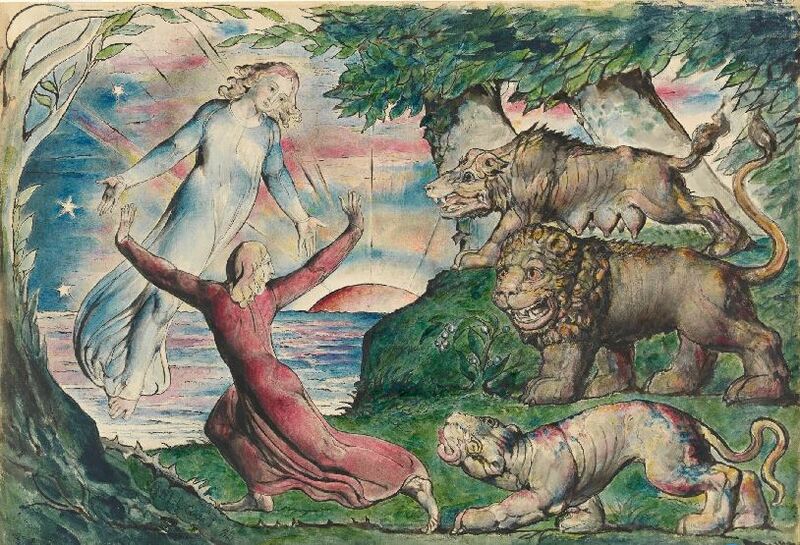 Unlike other illustrators, for William Blake the illustration of a literary work meant commenting on and interpreting it in the light of his own creative, visionary experience. Therefore, although Blake fully acknowledged the authority of the Commedia’s inspiring vision, the imaginative re-formulation in pictorial terms of that same vision opens the way to an independent creative act capable of revisiting and amending Dante’s text. The analysis of the figurative “licence” taken by Blake thus points us toward a fascinating interpretative pathway wherein, besides a number of radical divergences, we not infrequently come across an aesthetic ideal in which the work of art expresses a religious spirit and universal knowledge that earns its rightful place within humanity’s sacred texts. Blake’s approach thus enables us to revisit the Commedia from unaccustomed, privileged angles: on the one hand, we have great visionary poetry reflecting on itself; and on the other, the image that translates the poetic word, “transforming” it into a new creation able to cast an original light on relevant aspects of Dante’s work and thought. In order to understand this caption, we must consider that in the 18th and part of the 19th century, Dante’s English reception focused almost exclusively on the Ugolino and Paolo and Francesca episodes. Of these two, the most popular was the story of Ugolino. This preference stems from the Protestant reading of Dante’s work which characterized the 16th century, when a widespread “selective” use of Dante took hold, with the aim of highlighting any possible pre-Lutheran elements in his works. In much the same way, readers of Ugolino’s story in the 18th century would tend to emphasize not so much Dante’s punishment of Ruggieri as a traitor, but rather Ruggieri’s punishment as a prelate, transforming the Dantesque condemnation of an individual into a condemnation of the system he represented and a denial of freedom. In the caption written by Blake, the vengeance to which the poet-painter refers is that of Archbishop Ruggieri. His interpretation of the Dantesque episode thus places Blake within that interpretative vein which, by extracting the episode from its context, transforms the Count into an innocent victim, and the Archbishop into the epitome of ecclesiastical tyranny. Indeed, Blake does not depict Conte Ugolino’s punishment in the icy lake of Cocytus, but during the highly “pathetic” days of anguish he suffers in the Tower of Hunger. Another element which becomes clear from Blake’s short caption is his belief that the true God is not and cannot be the God of the Church. This concept is of great importance in understanding the entire cycle of Dantesque drawings which Blake would undertake thirty years later also because it is already evident from this work. Ruggieri’s God is, in fact, called by Blake your God, to indicate Blake’s distancing of himself from the God of orthodox religion. Blake, who was profoundly contrary to Dante’s punishment system, believed that even Dante’s God was a cruel and vengeful one who could, in turn, “take vengeance”. 2. The Marriage of Heaven and Hell, Plate 16, 1790. 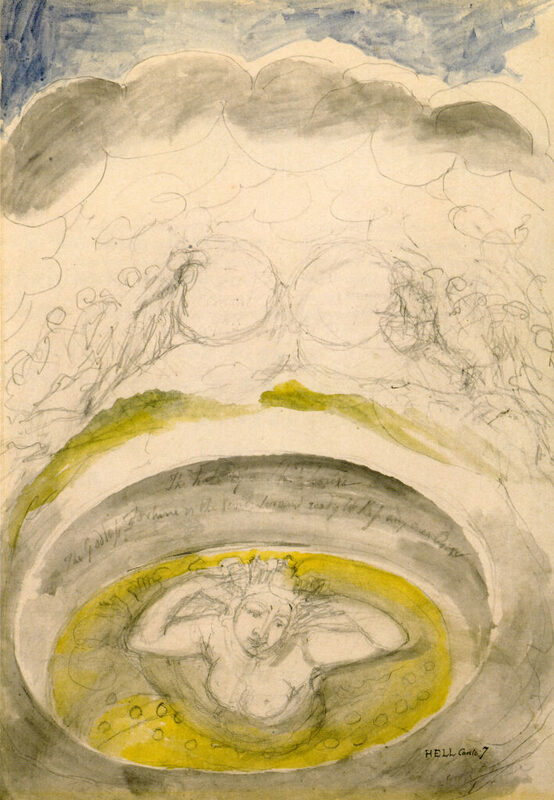 Another figurative version of Ugolino’s story, realized in 1790, was introduced by Blake as the sixteenth engraving of his Marriage of Heaven and Hell. Unlike the plate in Gates of Paradise, Ugolino and his sons are here shown as sleeping giants. 3. Head of Dante, ca. 1800. Around 1800, Blake executed a portrait of Dante for William Haley’s library in Turrett House, the first in a series of “heads” of illustrious poets commissioned by Haley. Once again, in the background behind Dante’s head, appears a version of Ugolino’s story, different from any of the others he had previously made. Here, Ugolino sits in profile on the right side of the painting looking toward the Poet. In his arms, he holds one of his grandsons, while another grandson kneels beside him. 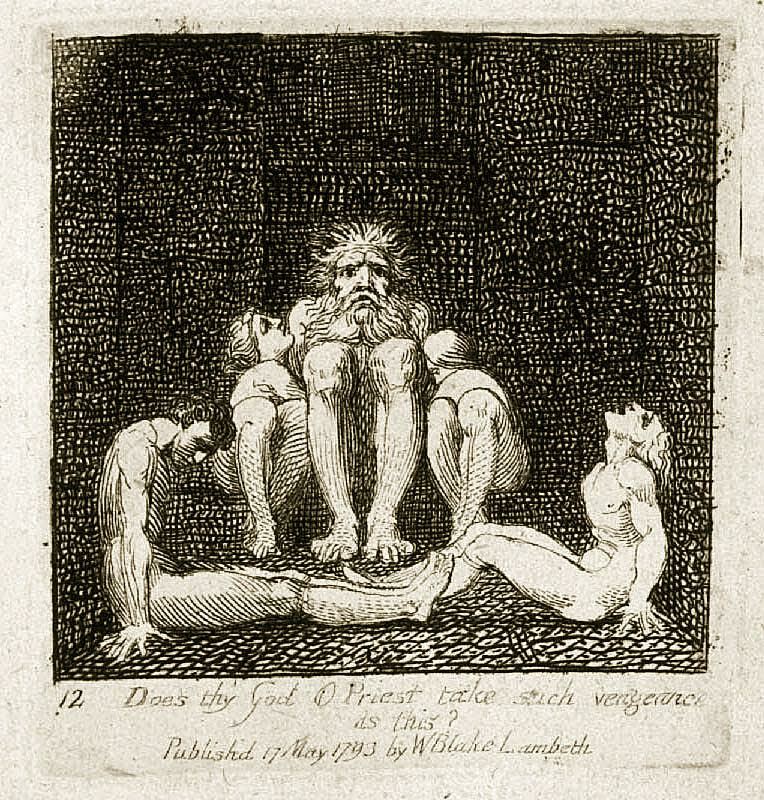 His two sons are in the foreground; the first is seated and holds in his lap, as if sustaining it, the head of the other son who lies prone, already dead. A brickwork arch frames Ugolino’s head, his wrists and ankles bound in chains prominently visible on the left side of the painting, attached to the wall with a metal ring. 4. Dante tugging at Bocca’s hair, Illustration to Inferno. 5. Ugolino relating his death, Illustration to Inferno. 6. Ugolino in the Hunger Tower, Illustration to Inferno. 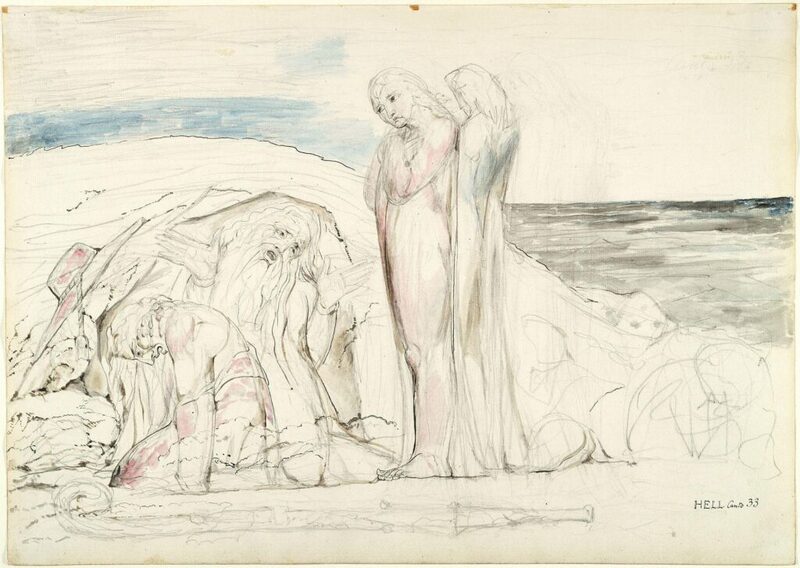 In the cycle of watercolours undertaken between 1824 and 1827, of which three were dedicated to the Ugolino story, Blake returns Ugolino to his original context. It is nonetheless relevant that he includes a crozier in the first drawing (Dante tugging at Bocca’s hair), to which a prominent tasseled hat is added in the second drawing (Ugolino relating his death), next to Ruggieri’s figure. With the exception of the last of these three drawings (Ugolino in the Hunger Tower), Ugolino no longer appears as the hero of an isolated tragedy, as was the 18th-century custom, but as Ugolino the traitor, punished in the ice of Cocytus and intent on gnawing at Archbishop Ruggieri’s skull. This is particularly significant because it shows in Blake’s work the evolution from an 18th-century “anthologization” of the Commedia to a greater awareness of the structure of the Poem and the intentions of its author. 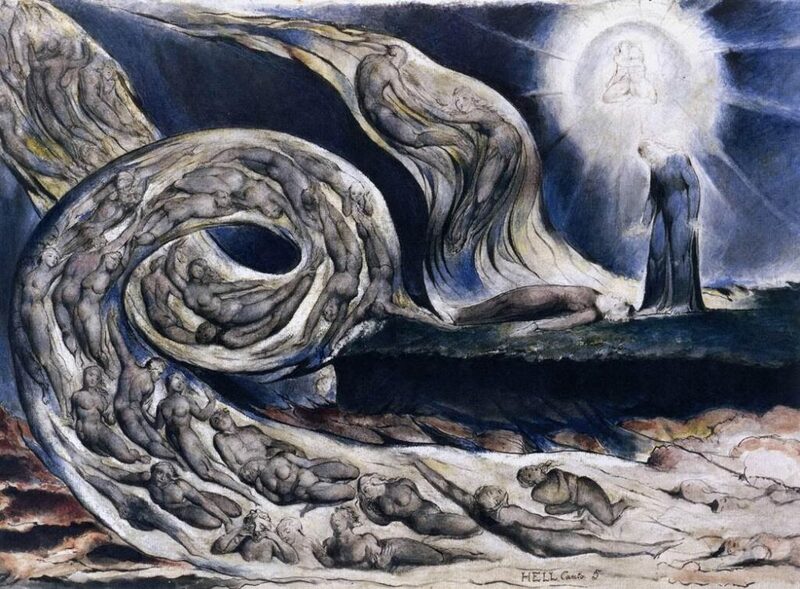 In the third drawing of the Ugolino episode, we have a similar version to the one Blake had realized for his Gates of Paradise. 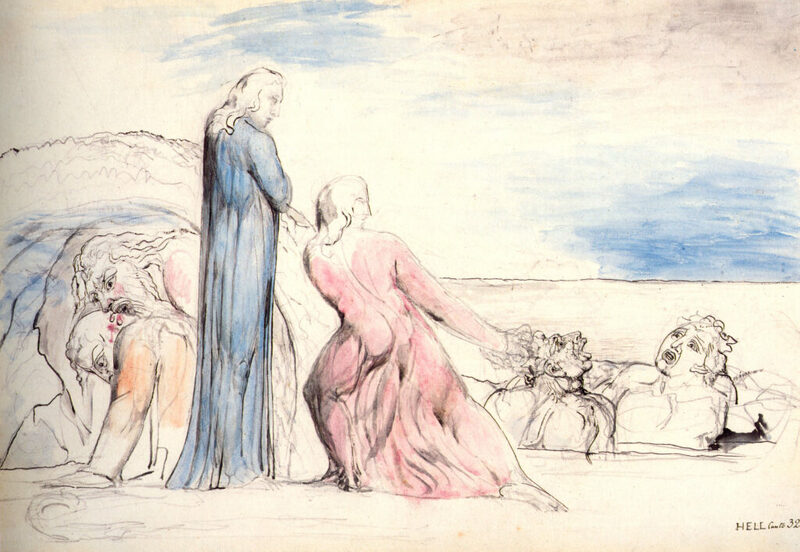 The presence of two angels hovering over the group suggests final salvation and seems to point to the fact that, in Blake’s interpretation, Ugolino is at last forgiven. The same two hovering angels appear in a tempera painting realized by Blake in 1826 or 1827. This beautifully colored painting is nearly identical in composition to the unfinished pencil drawing from the Dante series. 8. The Whirlwind of Lovers, Illustration to Inferno. Consideration of the other topos of the Romantic reading of the poem, the episode of Paolo and Francesca, also reveals Blake to be a more attentive and aware reader than most of his contemporaries. If, indeed, the custom was to represent the two lovers as absolute protagonists of a private tragedy (see, for example, Flaxman’s treatment of the same episode), Blake breaks from this tradition, choosing to focus on the choral dimension of the story. 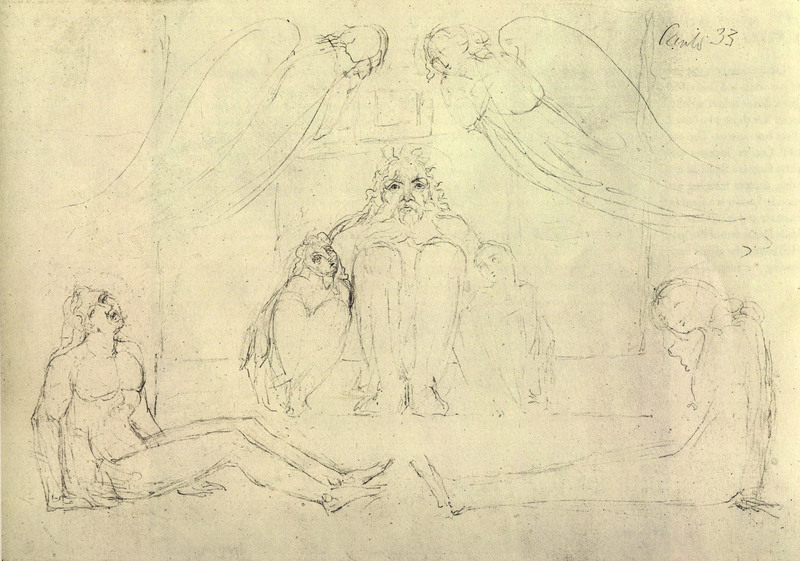 In this drawing, Paolo and Francesca are inserted within a broader context whose real protagonists, given the central position they occupy in the composition, appear to be Dante, who has fainted, and Virgil. The left side of the illustration is completely taken up by the vortex of the hellish storm, while on the right a corner of light is reserved for the lovers: a small sun in the darkness of Hell, which surprises them, still in their embrace. 9. Dante Running from the Three Beasts, Illustration to Inferno. One of the prominent features of Blake’s illustrations is his manner of depicting Dante and Virgil. Rather than being historically determined figures they appear as diaphanous images. By this choice, Blake openly declares his lack of interest in either the historical reality of the two poets or the literal meaning of Dante’s journey. In his view, human existence implies a clear distinction between the natural, historical man, confined within the bounds of materialistic vision, called Selfhood or The Spectre, and the real man, called The Poetic Genius. It is this second ontological category alone, the one transcending perceptible reality, which Blake intends to depict in his images. In the illustration to the first canto of the Inferno, the image of the three beasts highlights the grotesque element that Blake frequently introduces into his plates. The “stylistic deformity” employed is an interesting feature. Since Blake was certainly not unaware of the moral and symbolic significance of the beasts in the Commedia, his decision to portray them almost as caricatures can only be attributed to that idiosyncrasy toward any type of moral allegory or symbolism manifested by Blake in much of his writing. Among the elements not originating from Dante’s text, Roe found the presence of briars and thorns at the poet’s feet. In his view they represent «those aspects of this life which bind man down to the material world and prevent him from attaining the spiritual freedom for which his soul longs» (1953: 48). Then Baine identified the small plant full of berries straight in front of the lion with poetic laurels (1987: 115). Futhermore, Roe shares Wicksteed’s idea of the symbolic meaning of the positions of the right and left feet in Blake’s illustrations, the right being associated with the spiritual aspect of man, and the left with the material (Wicksteed 1910). According to this theory, it should be noted that while the three beasts each have their left feet advanced, Dante and Virgil step forward with their right feet. We also see that Dante’s references to the darkness of the wood («oscura» in line 2, and the place where «’l sol tace» in line 60) are in no way portrayed in the watercolour. Blake’s wood is neither dark, nor fearful. This decision is probably connected to Blake’s refusal of the doctrine of sin and the orthodox conception of Dante’s Inferno. 10. The Goddess Fortune, Illustration to Inferno. In the fourth circle of Hell, Dante and Virgil encounter the Miserly and the Prodigals, whose punishment consists of rolling great weights against each other while hurling mutual upbraidings. The pitiful spectacle of the extraordinarily numerous souls rolling weights «by main force of their breasts», offers Virgil the opportunity to digress on the vanity of the goods which are committed into the charge of Fortune. This raises Dante’s question about the very nature of Fortune: «My guide! of thee this also would I learn: / This Fortune, that thou speak’st of, what it is, / Whose talons grasp the blessing of the world» (Inf. VII, 68-70). By confuting the opinion he had expressed in the Convivio (IV, XI 6 ff.) with a new assessment, Dante has Virgil declare Fortune an agent of divine providence (Inf. VII, 73-81). New pains, new troubles, as I here beheld. «It seems as if Dantes supreme Good was something Superior to the Father or Jesus [as] <for> if he gives his rain to the Evil & the Good & his Sun to the Just & the Unjust He could never have Builded Dantes Hell nor the Hell of the Bible neither in the way our Parsons explain it It must have been originally Formed by the Devil Him self & So I understand it to have been (Erdman 1982: 690)». «Whatever Book is for Vengeance for Sin & whatever Book is Against the Forgiveness of Sins is not of the Father but of Satan the Accuser & Father of Hell (Erdman 1982: 690)». (...) “ O say, my guide! Their light in equal distribution pour’d. Beyond prevention of man’s wisest care. Turning now to the illustration, it is clear that the whole composition represents a critique of Dante’s cosmology and theology as expressed in the quoted passages. 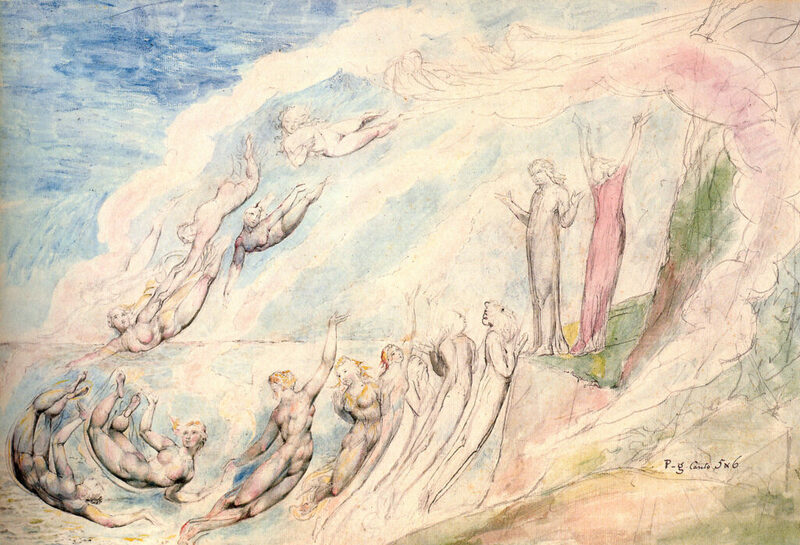 The distinction described by Dante between the heavens governed by God and the earth governed by Fortune, is at odds with Blake’s own thought, for he firmly believed in the conciliation of opposite principles, as can be seen, for example, in the title of his Marriage of Heaven and Hell. One of Blake’s chief concerns is the relationship of the spiritual and the natural worlds and the very concept of the “globe” is identified by him with the limiting of human imagination within the seeming confines of the material world. Since he denies that Dante’s God can be the real God, both the Celestial and Terrestrial globes belong to the material world, and therefore are placed beneath the clouds, so the Goddess Fortune seems to rule over the whole composition. 11. The souls of those who only repented at the point of death, Illustration to Purgatorio. The plate illustrating canto V of Purgatorio is an example of the iconographical translation of a similitudo by Dante. The “Miserere” in responsive strains. Furthermore, it is curious that Blake did not illustrate the episodes of Jacopo del Cassero, Buonconte and Pia, choosing instead the pictorial “virtuosity” of Dante’s simile of «fiery vapors» and «with loose rein a troop». Blake’s decision is still more relevant when we consider that the episode chosen by other illustrators, such as his close friends Flaxman or Füseli, was that of Buonconte’s ultimate fate, with the concluding scene of the angel and the demon fighting over his soul. It would seem that Dante wished to show blatantly what Virgil had just claimed and raised his arms in order to prove to the wondering souls that his body «Gave way not for the rays to pass» (Purg. V, 26). We should also remark that the internal structure of this canto requires that the encounter with the three spirits who tell their story shall occupy the whole second half of the canto, symmetrically and significantly corresponding to the fifth canto of Inferno, featuring Paolo and Francesca. In both cases, it is a tale of violent death. We cannot rule out the possibility that Blake intended to transpose in his picture the symmetry between the two cantos by returning to the pictorial theme of the vortex he had already used for Inferno V.
Adams H. (2009), Blake’s Margins. An Interpretative Study of the Annotations, Jefferson, North Carolina, and London: McFarland & Company, Inc. Publishers. Ault D. D. (1974), Visionary Physics: Blake’s Response to Newton, Chicago: University of Chicago Press. Baine R. M. (1986), with the Assistance of Mary R. Baine, The Scattered Portions: William Blake’s Biological Symbolism, Athens, Georgia: Distributed by the author, Department of English, University of Georgia. Baine R. M. (1987), Blake’s Dante in a Different Light, in «Dante Studies», 105, pp. 113-136. Barilli R. (1983), Blake e il «gran rifiuto» dell’epoca moderna, in Gizzi 1983, pp. 13-21. Bellonzi F. (1983), Blake spiritualista visionario e il suo incontro con Dante, in Gizzi 1983, pp. 17-21. Bentley G. E. (2004), Blake Records, New Haven and London: Published for the Paul Mellon Centre for Studies in British Art by Yale University Press. Bindman D. (2000), William Blake: La Divina Commedia, Parigi: Bibliothèque de l’Image. Bindman D. (20001), William Blake: the Complete Illuminated Books, London: Thames and Hudson. Blunt A. (1954), Blake’s illustrations to the Divine Comedy, in «The Burlington Magazine», XCVI. Braida A. (2003), The Literalism of William Blake’s Illustrations to the Divine Comedy, in Image and Word, Reflections of Art and Literature from the Middle Ages to the Present, ed. by A. Braida and G. Pieri, Oxford: Legenda. Braida A. (2004), Dante and the Romantics, New York: Palgrave Macmillan. Briganti G. (1983), Blake all’Inferno, in «FMR», 14, pp. 73-75. Butlin M. (1981), The Paintings and Drawings of William Blake, 2 vols., New Haven and London: Yale University Press. Cary H. F. (1868), The Vision, or Hell, Purgatory and Paradise of Dante Alighieri, translated by the Rev. Henry Francis Cary, New York: D. Appleton & Company. Damon Foster S. (1988), A Blake Dictionary. The Ideas and Symbols of William Blake, Revised Edition, With a new foreword and annotated bibliography by M. Eaves, Hanover and London: University Press of New England. De Santis S. (2017), Blake & Dante. 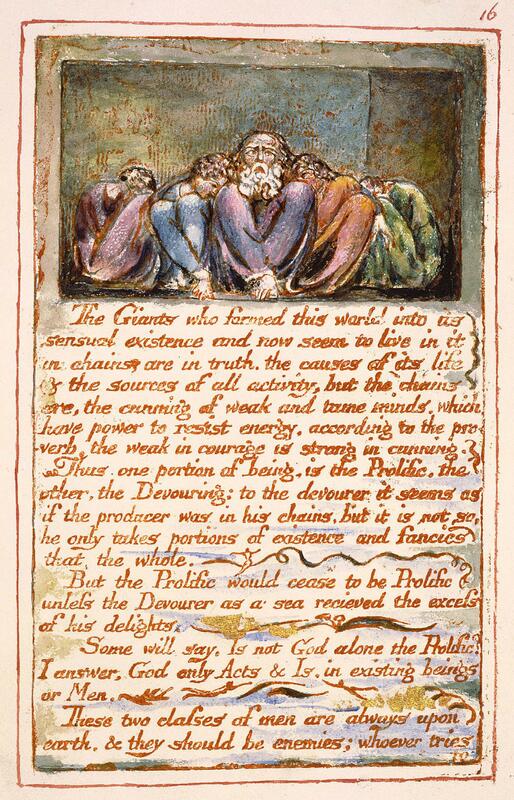 A Study of William Blake’s illustrations of the Divine Comedy including his critical notes, Rome: Gangemi Editore International. De Santis S. (2014), La similitudo dantesca nelle illustrazioni di William Blake, in Dai pochi ai molti, Studi in onore di Roberto Antonelli, ed. by Paolo Canettieri e Arianna Punzi, 2 vols., I, pp. 775-791. De Santis S. (2011), William Blake e la Commedia dantesca, in «Critica del Testo», XIV/2, pp. 613-642. Erdman D. V. (1982), The Complete Poetry and Prose of William Blake, Newly Revised Edition, ed. by David V. Erdman, Commentary by H. Bloom, Berkeley and Los Angeles: University of California Press. Frye N. (1947), Fearful Symmetry, A Study of William Blake, Princeton: Princeton University Press. Fuller D. (1988), Blake and Dante, in «Art History», vol. 11, n. 3, pp. 349-373. Gizzi C. (1983), ed., Blake e Dante, Milano: Mazzotta. Hoff U. (1983), Le illustrazioni dantesche di William Blake, in Gizzi 1983, pp. 43-45. Klonsky M. (1980), Blake’s Dante: the Complete Illustrations to the Divine Comedy, New York: Harmony Books. Paley M. D. (2003), The Traveller in the Evening. 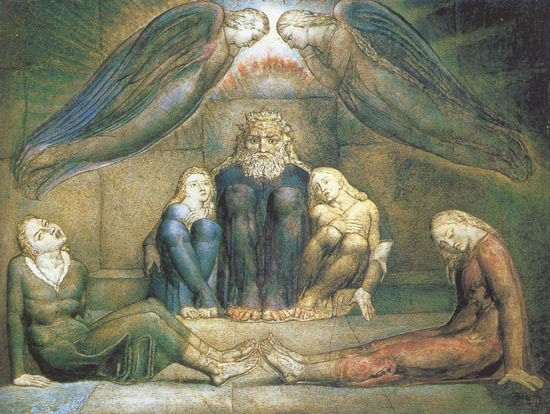 The Last Works of William Blake, Oxford: Oxford University Press. Pyle E. (2015), William Blake’s Illustrations for Dante’s Divine Comedy. A Study of the Engravings, Pencil Sketches and Watercolors, Jefferson, North Carolina: McFarland & Company, Inc., Publishers. Roe A. S. (1953), Blake’s Illustrations to the Divine Comedy, Princeton: Princeton University Press. Salvadori F. (1999), L’Inferno redento. William Blake interprete di Dante, in «Lettere italiane», 4, pp. 567-592. Tinkler-Villani V. (1989), Visions of Dante in English Poetry, Translations of the Commedia from Jonathan Richardson to William Blake, Amsterdam: Rodopi. Toynbee P. (1909), Dante in English Literature from Chaucer to Cary, (c.1380-1844), 2 vols., London: Metheun & co.
Ulivi F. (1983), William Blake tra i «messaggeri celesti» e Dante in Gizzi 1983, pp. 46-52. Viscomi J. (1993), Blake and the Idea of the Book, Princeton: Princeton University Press. Yates F. (1951), Transformations of Dante’s Ugolino, in «Journal of the Warburg and Courtauld Institutes», vol. XIV, Nos. 1 and 2, pp. 92-117. Yeats W. B. (1896), William Blake and his Illustrations to the Divine Comedy, «The Savoy», pp. 41-57.